It had long been speculated that the December Board of Governors meeting would be the one where the NHL finally makes a decision on expansion and awards Las Vegas its first professional sports franchise ever. Unfortunately, it appears a final vote will not take place at this meeting. However, that does not mean it’s a date you should cross off on your calendar. A lot is expected to come from the Board of Governors meeting, including some discussion on expansion. The meeting will be held in Monterey and will officially begin on Tuesday. Here’s what you should expect to hear when it’s all said and done. On Monday, the day before the actual meeting kicks off, there will be a gathering of the executive committee of the Board of Governors. If all goes well, there should be an announcement of when the final vote will take place. Expect that to be sometime on or around January 31st, the date of the NHL All Star Game. 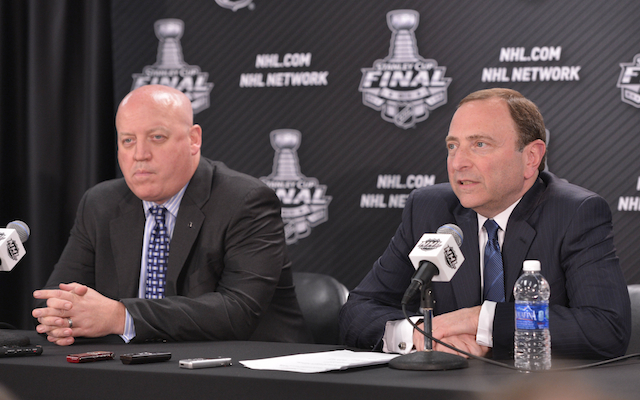 You can also expect to hear a number of quotes from Bill Daly and Gary Bettman regarding the timeline moving forward. In the past they’ve been pretty forthcoming in saying that 2017-18 is still a possibility, but depending on the discussions with league owners, this may change. Finally, we expect to get more information on the cities possibly holding up the process. Broward County’s arena vote will occur before the meeting and will certainly be discussed one way or the other, and with Peter Karmanos, Jr. (Hurricanes owner) on the executive board, relocation from Carolina should be cleared up before the expansion discussion gets to the full meeting table. Aside from expansion, the board is expected to touch on topics such as coach compensation, future salary caps, concussion protocol, and a revisitation of the All Star Game format and 3-on-3 overtime. We are not expecting big news, but we should have plenty to read between the lines with. However, any time the big wigs come together, there’s always a chance that major news comes our way. Be sure to follow us on Twitter and Facebook to stay up to date with the latest NHL to Vegas news.